Please, someone should stop the clocks, someone should ask the dog in the alley not to bark tonight. Someone should go to the street and ask drivers not blow their horns and to drive slowly. I don’t want to hear screeching tires’ sounds. I don’t want birds singing tonight. I don’t want to hear any noises tonight. Please turn off the lights, I want it dark. Dark so that I can’t see myself or around me or nor the windows. My hands are numb, I can’t find my feet. Something is going wrong with my eyes; they seem to burn with acid. I can’t search nor see the windows. I want tonight darkened, I don’t want to see the stars gleaming up there, and someone should be out there to prevent the whiteness of the damn moon too. The moon and the stars are not wanted tonight. Someone should pull them down and pack them and put in the trash. I want everything silent like darkness, like tonight. Let the wind stop blowing on the trees. If the autumn arrives, let its dead leaves shed on the moon to make it blind. I want tonight dark like a grave. I don’t want to see trees blowing in the wind tonight. Someone should answer my question, why is it so long tonight? Why can’t I see my feet? Someone comes by accident, leaves by accident, and is that all that life means? My fingers are numb on the keyboard, I can’t write him back. What should I write? I feel chilly and lethargic. It seems like I am steeped in a mountain of sorrow. No news was ever more devastating to me. I lost my mom, my beloved one; I lost my big supporter who always supported and saved me from dangers. It is damn college exams days, it is silence instead of smile. Because you are not here. Because you are not calling me and I don’t hear your laugher anymore. You are not asking me over the phone: “my son, come home, I miss you.” Because you left this world. Because life is over, it ends my happiness too and starts a new season, which is sorrow and crying a river. Because you didn’t wait to see your farmer son come back to you from college. Mom! You could wait to listen to my stories. Damn this life when I found myself, I left you and dad in search of food to survive. I remember those days on the farm, when we worked together to feed our herds, you told me: “my son, one day, I want you be a man for yourself.” You could wait and I wanted to demonstrate how I fulfilled your wishes. I remember last year, I came to visit you. The road was closed because of fighting. I took different paths, stretching to mountains and desert and finally to reach you. After four days, I was there with you. I was there once again to refresh my commitments and to tell you I am a man on my own now. Last year, once again, I felt your thick and strong hands which one day held me, caressed me, pulled me up from the ground, left my arms and gave me wings to fly. My friends were asking me: “how is your mom?” I had only one answer: “she is fine and using her medicine regularly.” In 2004, my mom was suffering from an unknown illness. Finally, in 2005, doctors found out that she had diabetes. Although diabetes is possible to treat, in Afghanistan it is hard and even to some extent it is impossible to cure diabetes. It was last year in June; to visit her, I went by motorbike after four days and driving 16 hours every day in the mountains, I reached her. No one knew when I arrived in the village. I parked my motorbike in the corner of our old house, started searching from room to room for my mom. I found her sleeping. After taking a few breaths, hesitantly I said: “salam mom, this is Nasim.” She woke up, jumped up and hugged me. 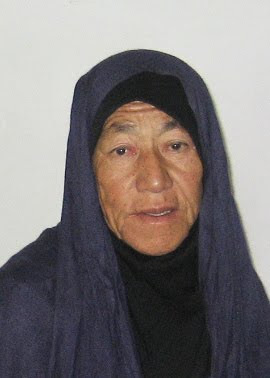 She was a strong woman, still young, just 60 years old. I released myself in her arms, just like a baby does. We both wept until everyone noticed of my arrival. I didn’t see her a lot since I was 12 or 13. I moved out of the village and went to the city. Later I left to Pakistan, Iran and the U.A.E. She was a young and strong woman who worked on the farm. Her dream was that I become a cleric. She was a generous woman and always telling me: “Nasim, if a panhandler knocks on the door, offer him tea, feed him, and don’t let him go away without help.” It is her lesson that I remember in the Philadelphia or D.C train stations, when I see homeless or poor people, her words resonate: “help poor people, what goes around, comes around.” She never heard the words of human rights, but by instinct she knew and she taught me to be humanistic. In 2006, your son “Hadi” took you to Iran for a pilgrimage to the Imam Reza shrine. Later, when you returned back home, I came home to visit you and I congratulated that for you. Still, you wished to go to Hajj. In 2008, you went with your eldest son “Zahir” to Saudi Arabia for a Mecca pilgrimage. You visited the house of God. Zahir told me that he had doubt about your energy and your ability to move around God’s house. But he was surprised of your energy and your ability. He said: “When mom started walking towards Mecca, I called her a lot but she didn’t hear me.” You were freed of yourself, you were with your God, and you were Godly in that moment. He said that he lost you and searched you for hours and hours. But miraculously, finally, you meet each other. This is was your heavenly sign. Mom! You didn’t wait for me. I want your demure smile now, your scent and your looks. I want your strong hands to cover my face, I want you telling me your fairy tales like you did in my childhood, I want your encouragement and your support. I feel so weak and unproductive. No no, she is not here anymore. I want her now. I want to go back to her and find her at the corner of the room, sitting and sewing socks and gloves for her children. I want her telling me: Nasim, bring me a glass of water from the small stream which is few meters away from our house. I want her asking me go to the farm and collect grass for sheep, goats and cows. No no, she is not there anymore. No one is there to listen to my words; no one is there that I can share my stories and my pains. She was that only friend that I could share everything with. I lost her. No one will be as worried about me as she was. No one will call me constantly that there is a season of fresh milk and yogurt. Mom! You could wait for me to see your son. You could wait to see how much I am changed and have become a man for my own. That was your dream and your wish that I become an independent and wise man. You could wait to see the result of your hard working during my childhood that you have taken care of me and spent your life to grow me up. Mom! You could wait to see your son, the son of your hardships, painful days and distress. You could wait until I finish my education and come back from the U.S. I remember how much you and dad were happy last year when I told you: “mom, I am going to the U.S for higher education.” You were about to burst of happiness. You could wait and see your Nasim is no longer a naughty boy, he has traveled around the world and shaken hands with great people. You could wait until I come back and I would tell you the stories, but now to whom I share my stories after you? You could wait, you were just 60 years old. Mom! Right now, I want to find myself with you in those days that followed the grasslands; steep pastures that I was collecting hay for the cattle. Mom! No one would call me champion of mom anymore and no one would admire me as you did. I was your hero, because I used to work with you on the farm, because I carried your baskets and your grass loads in the field. We together fed the cattle and cows. Mom, when you were milking the cows and sheep, I was taking the bucket, I was providing you fresh water from a small stream which seemed as a vein in the village. I remember those days in soft summer, that wind blowing on the tree in front of our muddy house and the leaves and the little branches were trembling over. I remember those moments we were all sitting and having our breakfast and lunch in a hot summer under the shadow of trees. I remember those days I was collecting wood for your oven. When you were making bread, I was making tea for us. I remember that when the first bread was out of the oven, you were giving me that with a glass of milk insisting: "Go to your school before its going to be too late." Mom! I remember the days that you told me when I had just been born, due to Soviet Helicopter patrol over the village, you had taken me to the mountains to protect me. I remember you told me how it was hard to hide from Soviet helicopter’s patrol. Although I do not know anything about those days, all the pain and suffering from those days, I have with me today. I bow down before you and your pain. Mom! You were different to others. As far as I remember, when your sons were coming back from their journeys and bringing gifts for you, you were giving them to your daughters “Nikbakht” and “Aqila”. You had a pair of silver bracelets. Every kind of jewelry, you gave to your daughters. But instead of jewelry you had a heavenly love and I found you always praying. But no no, she is not here anymore. I would like to hear her voice now. I want to find myself in her arms. Mom! My beloved! In all my life I learned from you. I am everything because of you. You have taught me to have perseverance. When I close my eyes, I can image you. You are holding me between your arms and tap on my back and say: “Don’t be lazy, look around, move fast, learn from others, be honest, don’t lose your self-confidence, and keep the path of perseverance.” These are the lessons I have learned from you. I heard, after you everything went to silence. No one talks loudly to each other, they dress in black, walk slowly, your place at the corner of our old house is empty. Near the furnace, where in winter was the warmest place. Where you were sitting and making socks, jerseys, gloves for your children. After you, we all became wanderers. Your smallest, tender and beloved son, Qasem, is studying in Kabul. Juma Khan went to Iran. Zahir and Hadi are in Dubai. After you, all are scattered in different countries and cities. I heard all this from Qasem. I am unaware of everything in this corner of the world. If you remember, last year when we talked on the phone, you asked me, where am I living? I said in America. You asked me where that is. I answered that it is in this corner of the world. You asked me to come home. But now, I ask myself who will worry for me after you? But mom! You are like a sun shining in my life, like a moon lighting my nights. You are alive in me forever. Please forgive me if I was far from you, forgive me if I couldn’t take care of you, and forgive me if I had to run after food to survive. But mom! You are my strength when I feel weak, your memory gives me energy. You are giving me power to pursue my success and happiness, although, these nights have no stars in the sky and my days are rainy. But these stormy days will end soon and I will no longer be lost on the way back to my room, because I have you with me. Mom! It was a great honor for me that you lived with me, took care of me and gave me wings. Thanks for all your efforts, thanks for all your love and the kindness you had for me. It is our trajectory that we all will return back toward him. With the beauty and glory of God that is bestowed on you, may God rest your soul in peace. Rest peacefully, Hawa, my beloved mom!